Volkswagen is showing up in style to the Dusseldorf Caravan Salon with the Topos Caddy Sail Design Concept, a version of their Caddy commercial van converted to mimic the style and functionality of a sailboat. Rather than just adding some pinstripes and wood siding, the Topos Sail concept has a working wooden deck with aluminum rails. The deck bends to to make a convenient place to lay out and enjoy the sailing, but the most trick piece might actually be the wooden ladder built-into the glass that makes the roof accessible. A wooden deck roof is at least 1,000 times cooler than a gold-plated roof, and much classier. Press release below the jump. 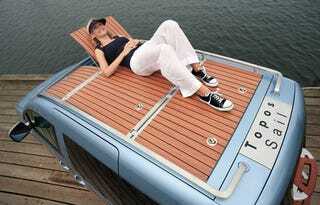 The Caddy Topos Sail Design Concept - A Caddy With a Boat Deck! MILTON KEYNES – August 27, 2008: Among the display of leisure vehicles and campers on the Volkswagen Commercial Vehicles stand at Europe’s largest recreational vehicle show that starts in Düsseldorf, Germany this weekend will be an interesting Caddy Topos Sail design concept which takes its nautical theme to the extreme of having a wooden boat deck on its roof. The Caddy Topos Sail design concept, based on the smallest model in the Volkswagen Commercial Vehicle van range, uses design cues from classic yachts and has its multi-functional roof covered with wooden decking surrounded by aluminium roof rails. The wooden sun deck on the roof is accessed via four matching wooden and aluminium steps in the Caddy’s tailgate, and to complete the design theme there are wooden inserts along the side of the vehicle and in the rear bumper. Other highlights of the Volkswagen stand demonstrate its strong heritage in leisure vehicles with a celebration of 20 years of the California camper. Volkswagen campers became popular almost as soon as the Transporter van was introduced in the 1950s, and the California model was introduced in 1988 when the third generation of the Volkswagen Transporter was in production. With California conversions of the subsequent fourth generation of Transporter van and today’s latest fifth generation model, more than 80,000 have been sold, which must make it one of the most successful campers ever. Today’s California was introduced in 2006 and is unique as it is now made by Volkswagen, who must be the only vehicle manufacturer to produce its own camper. It is built to the same high quality standards as the rest of the range, and sold with a full three year warranty. The Volkswagen Commercial Vehicles stand can be found in Hall 16 at Dusseldorf Caravan Salon (www.caravan-salon.de), which is open to the public from 30 August to 7 September.